Many of us might be sales professionals, but we’re really relationship experts. 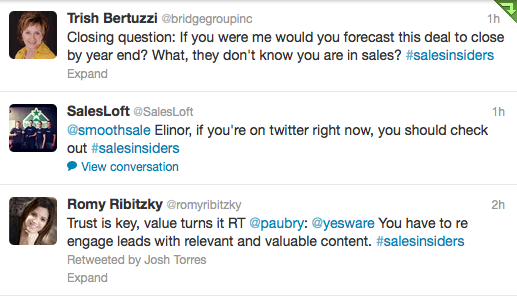 In our first #SalesInsiders Twitter Chat, hosted earlier today by SalesLoft, The BridgeGroup Inc, and Yesware, we couldn’t help but notice that the questions we got—even those about making goals and evaluating your pipeline—mostly kept a keen focus on the customer. We’re happy to see that. Because making sure that you’re adding value to your customers, that you’re helping them stay competitive and relevant in an increasingly cutthroat market, is what separates you from your competition. Q: What free sales tech tools do you use? Q: How do you re-engage old prospect to turn a “no” into a “yes”? Q: How do you analyze your current pipeline to set yourself up for closing more deals before the quarter ends? A: @bridgegroupinc: Use yr execs to call execs to get a deeper sense of the deal &what can be done to close it by yr end. Ask & ye shall receive. Always go into any prospecting situation prepared. Research the company you’re propositioning, answer why you’re relevant to them, what pain you solve, and why you stand out from your competitors. This may all sound basic, but you’d be surprised how many salespeople fail to do this first step. Always assume that as prepared as you are, you don’t fully know what their decision-making process is—and that there will be stumbles and obstacles along the way, says Trish Bertuzzi of The Bridge Group Inc. “Review & Redo,” is one of her mottos. Ask direct questions and don’t forget to listen. That’s what we’re here for. Until next time, see you in the Twittersphere #SalesInsiders.